By Alistair Reign, December 13, 2015 (Updated 5-18-2017), Alistair Reign News Blog. Displaced: child and mother live on the sidewalk. (Foreign Policy). Risking their own lives to save other people’s lives, on Wednesday a handful of humanitarian workers managed to beat the Saudi blockade of Yemen to deliver food and warm clothing to people in dire need (their homes have been flattened into uninhabitable piles of rubble and mangled rebar), orphaned children sleep in the dusty streets, and it is not an exaggeration to say there is no food to be purchased, nor water to drink or wash. Displaced: orphaned children sleep in the streets. (Yemen Twitter). 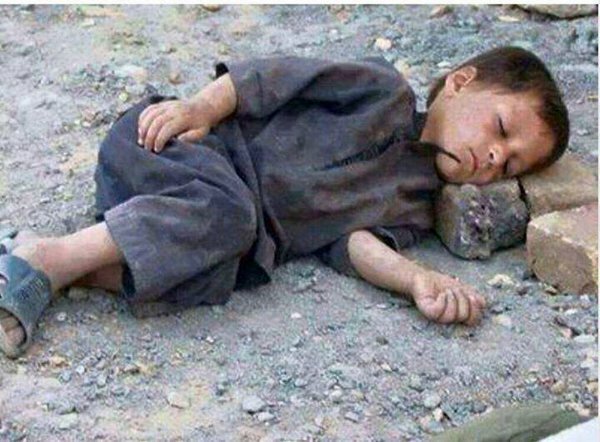 “In March 2015 Saudi Arabia, the richest country in the Arabian Peninsula and regional super-power declared war on impoverished Yemen. Backed by a grand regional coalition and the tacit agreement of the international community, Saudi Arabia has ravaged Yemen, raining missiles on its people. 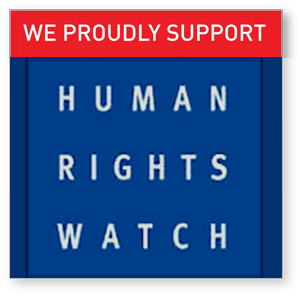 As weeks turned into months, Yemenis found themselves caught in the eye of a furious storm, the prisoners of a war they did not seek nor did initiate. 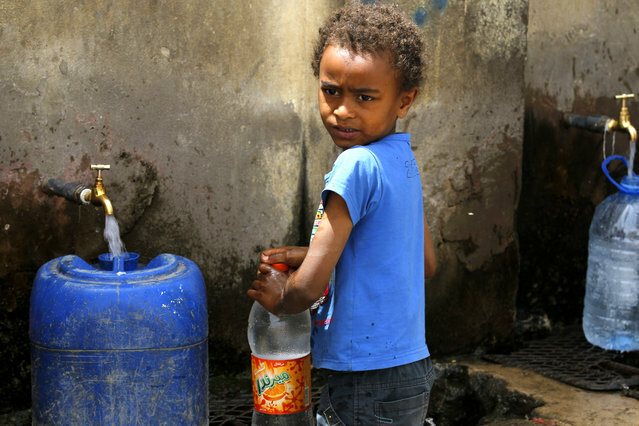 Sanaa: child collects water provided by philanthropist. (via google). 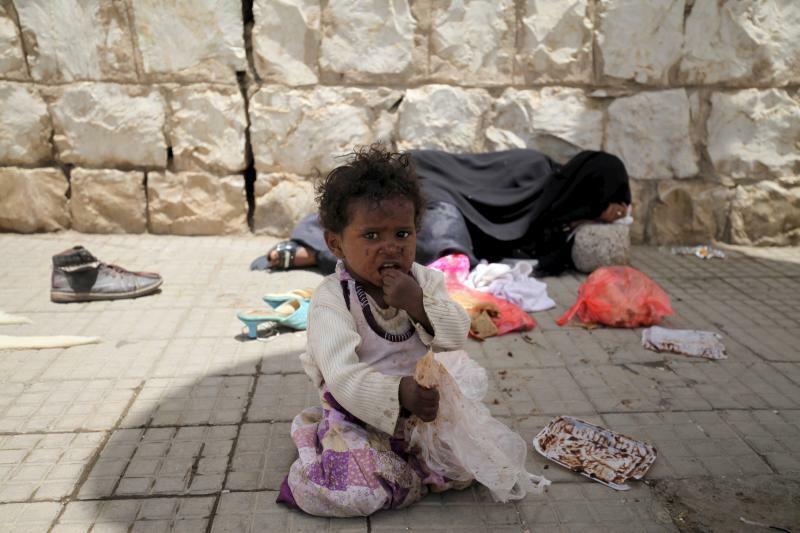 Suffocated by an embargo which has defied all humanitarian laws, Yemen has been cut off the world. With no food, no fuel, no access to clean water, no medicine, no shelter and no means to protect themselves from the harsh climate, millions await, completely destitute,” writes Catherine Shakdam. 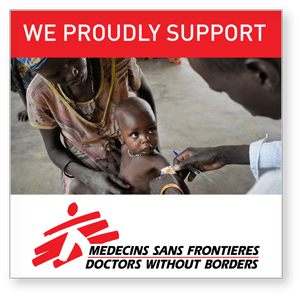 A few readers have inquired as to why I proudly support and recommend donating to the Mona Relief fundraising campaign. In response I wrote this article, and I dedicate it to all of the unrecognized soldiers of war – the civilians and medical staff fighting, and dying to keep people alive despite the increasing danger to humanitarian workers and medical facilities – where the rules of war meant to protect civilians and hospitals, apparently no longer apply. Mona Relief Director, Fatik Al-Rodaini chatting with a little girl during a distribution, (maybe asking what her favorite colour is for a winter jacket). (Photo: monarelief.org). 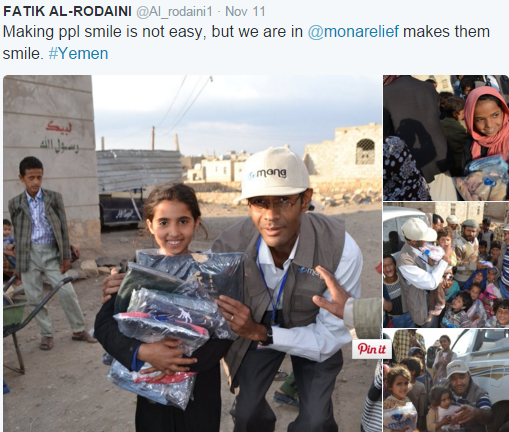 Fatik Al-Rodaini is Director and founder of Mona Relief, a Yemeni Registered Charity. He also accompanies the charity’s staff, and helps distribute their lifesaving care packages; always taking time to visit with families, giving some much-needed humanitarian hugs, and reassurance the world has not forgotten them. My interactions with Mona staff has been through social media and email communications, however I feel as though I have met the people whose dedication makes the delivery of aid possible in locations that are almost impossible to reach. I picture the men and women (taking a chance of being shot or imprisoned each time they deliver food), walking humbly down the street, unrecognized as heroes, expecting no adulation for their bravery, yet they have earned a place among the most heroic men and women in humanitarian history. Mona Relief Staff delivering lifesaving food, clothing, blankets and medicine to villages dying under the siege of Saudi-led War on Yemen. 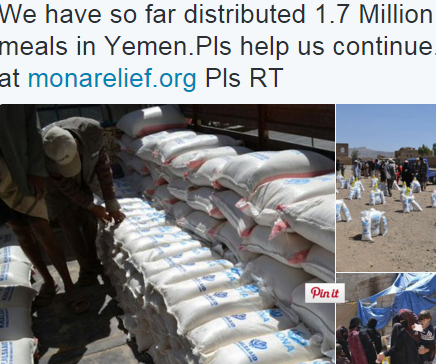 (Mona Relief Twitter). Despite the overwhelming risk of delivering lifesaving necessities to people under siege, these brave ‘civilian soldiers’ are crossing blockades with a mission to save Yemeni families from starving, or freezing to death. 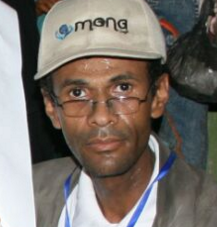 The consequences of defying the Saudi blockade is always present, but this risk does not stop Mona staff. 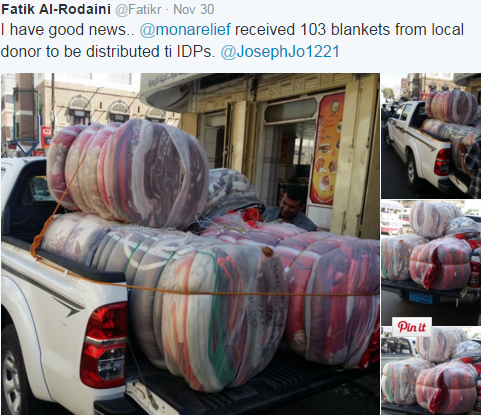 The following photo is a post from Mona’s Director, Mr. Al-Rodaini’s Twitter account, uploaded during Wednesday’s distribution. During Rodaini’s interview with Khabar News, he explained how Mona staff are mostly journalists and activists, all working in the cultural and humanitarian sphere. He spoke on how the organization evolved from when the fore-mentioned group began monitoring human right’s violations in Yemen, and witnessed the desperate need for humanitarian aid; by May the group was delivering food to the starving women, children, elderly, and disabled Yemeni people. According to Rodaini the organization is also investigating the targeted houses, as well assessing needs for proper distribution of aid to all internally displaced persons in Yemen. Fatik Al-Rodaini, Director, Mona Relief. True to his word, they have. 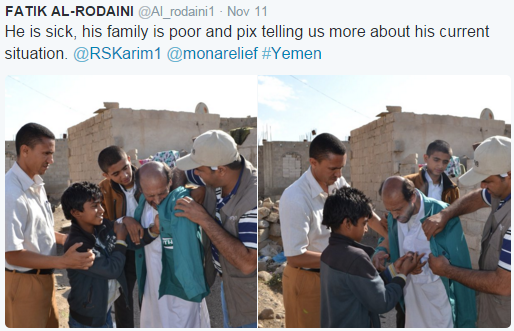 Below are posts from the Mona Relief Twitter page showing photos taken by the Mona team delivering food, clothing, blankets, and medicine to people dying under the airstrikes from the Saudi-led War on Yemen. Without your help millions of innocent people stand to die. If we wait for governments to act, thousands more will die. 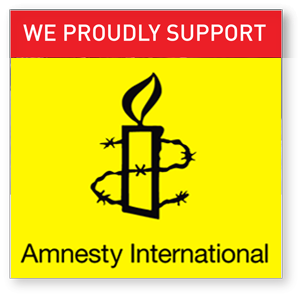 “Yemen needs your generosity and we need you to help us save its children. Every penny raised will be used to provide food, medicine and all other necessities to those most in need,” Catherine Shakdam, Mona Relief. 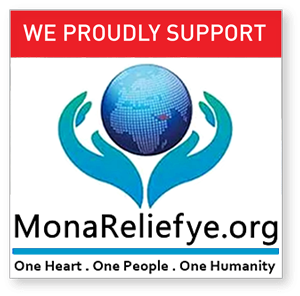 For more information on the Mona Relief Charity and their dedicated volunteers, you can visit their website here, and the Mona Relief Facebook page is located here. Follow their works on Twitter @MonaReliefye. Please donate generously to the Mona Relief ‘War on Hunger‘ campaign on our Go Fund Me – ColourOfWar fundraising page.